Cutaneous wound healing is the process by which the skin repairs itself after damage. It is important in restoring normal function to the tissue. There are two main types of healing, primary intention and secondary intention. In both types, there are four stages which occur; haemostasis, inflammation, proliferation, and remodelling. In this article, we shall look the mechanisms of wound healing, factors affecting healing, and wound infection. Remodelling – devascularisation of the region occurs, and the fibroblasts undergo apoptosis. The end result of healing by primary intention is (in most cases) a complete return to function, with minimal scarring and loss of skin appendages. 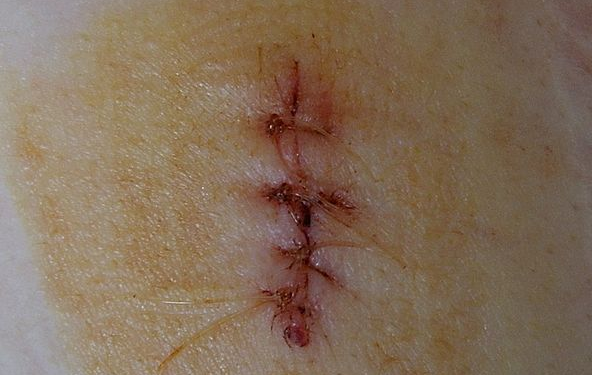 Figure 1 – A surgical wound, closed by sutures. This is an example of healing by primary intention. Any wound made by a scalpel will heal by primary intention. Surgeons can aid healing by ensuring adequate opposition of the wound edges – often by using surgical glue, sutures, or staples. Too loose and the wound edges will not be properly opposed, limiting the primary intention healing and reducing wound strength. Too tight and the blood supply to the region may become compromised and lead to tissue necrosis and wound breakdown. Healing by secondary intention occurs when the sides of the wound are not opposed – and so healing must occur from the bottom of the wound upwards. Haemostasis – a large fibrin mesh forms, which fills the wound. This is an important step, as the epithelia can only proliferate and regenerate once granulation tissue fills the wound to the level of the original epithelium. Once the granulation tissue reaches this level, the epithelia can completely cover the wound. Remodelling – the inflammatory response begins to resolve, and wound contraction can occur. Myofibroblasts are vital cells in secondary intention. They are modified smooth muscle cells that contain actin and myosin, and act to contract the wound; decreasing the space between the dermal edges. They also can deposit collagen for scar healing. 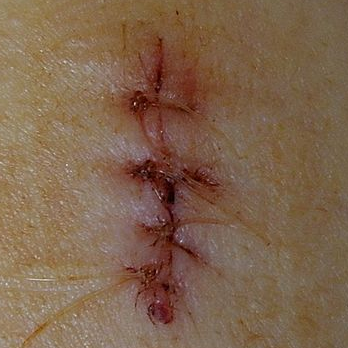 An uncommon complication from wound healing (particularly in people with darker skin), are keloid scars – whereby there is excessive collagen production, leading to extensive scarring. This can occur in both primary and secondary intention healing. Surgical site infections (SSI) occur when any infection gains entry to the body via a surgical environment. They represent 16% of all healthcare-associated infections. Wound contamination increases the risk of infection. It can be classified as per the US National Research Council guidance, which defines four classes of contamination, ranging from clean to dirty. Regarding healing by primary intention, which statement is true? Which of the following is a chemical mediator that promotes angiogenesis during wound healing? What is the role of the myofibroblast in healing by secondary intention? Which complication of wound healing is characterised by excessive collagen production? A patient has an open appendicectomy for a perforated appendix. Using the US National Research Council guidance, what classification of contamination is this?